The photograph on the left was taken around 1906 or a few years later. It shows the building then used by George Lane was much plainer than the present building used by Oxfam (see image at the bottom of the below). We have not seen any deeds for this property and our research has had to rely on our general sources such as census records and rate books. Fortunately we have seen the deeds of the adjoining property (37 High Street) which mentions that in 1820 the property to the south of that property (i.e. 39 High Street) was ‘formerly of John Bird deceased since of John Eeles and Thomas Barton and now of John Niblett on the south‘ and later deeds add that George Lane was the owner of the property in 1859. This enabled us to confirm our suspicions that the property was one of the two properties left by Jonathan Barton in his will dated 28th January 1769. It is interesting to note that 39 and 41 High Street still have a shared access from the rear out on to Soapers Lane, which must have derived from the time the Bartons owned the property or earlier. John Bird – we can’t be sure which period John Bird was associated with the property. We note however that a John Bird married Elizabeth Baker in Thornbury on 9th April 1730 but both of them were living in Hill at the time of the marriage. It appears that Elizabeth may have died shortly after the wedding as there is a record of Elizabeth the wife of John Bird being buried on 18th May 1730 at Hill. A John Bird was buried in Thornbury on 30th November 1750 and he was living in the Town of Thornbury at the time of his death. John Eeles – the land tax records of 1796, 1797 and 1800 show that John Eeles was owner of the property and that during that time he was renting it to Solomon Roach. Solomon Roach – shown as the tenant of the property in 1796, 1797 and 1800. There were several persons with this unusual name living in Thornbury during the 1700’s. We can’t be sure which one was living in the house in the period mentioned. The most likely is the Solomon Roach baptised in Tytherington on on 3rd January 1760, the son of Timothy Roach and his wife, Mary (nee Wonman). We believe this Solomon married Esther Allen in Thornbury on 7th October 1791. They had a son, James, born on 8th January 1792 and baptised on 29th January 1792 and a daughter, Esther, born on 25th September 1796 and baptised on 23rd July 1797. We also discovered that there was a Solomon Roach, late of Thornbury in Gloucestershire, charged at Wiltshire Assizes with stealing 3 cwt of cheese. This Solomon was transported to Australia on the General Hewett in August 1813. We had assumed that this might have been the Solomon married Esther until we found that this Solomon was aged 29 when transported. We don’t know when they moved, but they are recorded as being buried in the same churchyard at the Back River Methodist Church that James was buried in. Solomon died on 30th June 1843 aged 85 and Hester died on 12th February 1857. They are buried in the same grave. Their daughter (and James’ sister) Esther (or Hester) never married. She is mentioned as living in Back River in a newspaper report dated 18th December 1877. She reported having been robbed of 45 sovereigns, two half sovereigns and other smaller coins stored in a box tin in her bedroom. Two sisters were accused of having stolen the money. They had been employed by Hester and were doing some housework there when the money disappeared. The tin was found in the garden broken open. Hester gave evidence in support of the sisters saying she thought them to be honest and not believing that they could have stolen the money. The court found that they not prove a case against the accused and they were discharged. Thomas Barton – we are slightly puzzled by sequence of the names in the 1820 indenture referred to above. This implies that Thomas Barton was the owner of the property following John Eeles and before John Niblett. We know from Jonathan Barton’s will dated 1769 that he had purchased the property from his brother, Thomas Barton, but that was a long time before John Eeles was associated with the property. Another Thomas Barton (the son of Jonathan) owned the property next door (41 High Street) until 1809. It is possible that Thomas also acquired 39 High Street although we have no documentary evidence to confirm this. Richard Smart – the 1810 and 1812 land tax records appear to show that Richard had become the owner of the property. In 1810 he was renting it out to John Barnett. 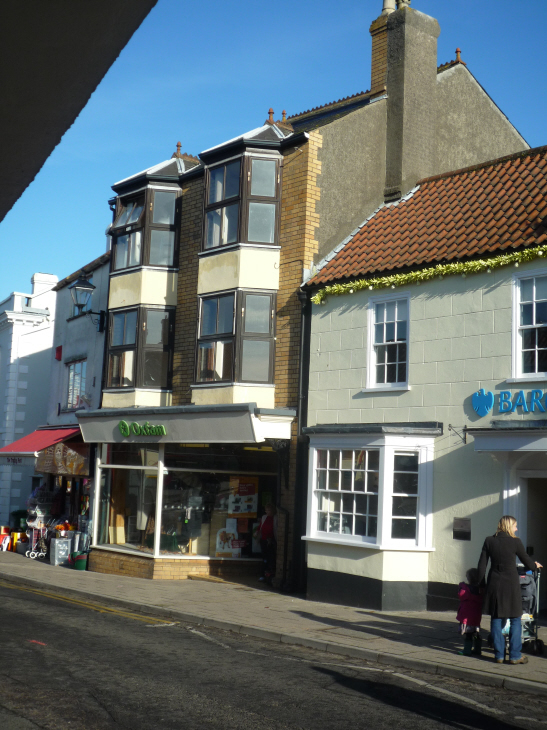 He also appeared to own and occupy the property next door (number 41 High Street). We don’t know anything about Richard. John Niblett – the land tax records show that John Niblett was owner and occupant of the property from 1819 to 1825. The 1826 land tax record shows he was renting the property to G. W. Parker. From 1827 onwards, William Rolph had become the owner although he continued renting it to G. W. Parker until 1832 at least, the last land tax record we have seen. We suspect John was the John Niblett born on 5th May 1790 and baptised on 6th June 1790. He was the son of John Niblett, a glazier and his wife, Hannah (nee Hodges). It cannot be John’s father who was living there as he died in 1816. On 22nd March 1812 John married Mary Stinchcombe and they had a daughter, Mary Ann baptised on 22nd October 1817. The baptism record shows John had become a glazier like his father. There is no sign of John Niblett in Thornbury after 1826. The 1841 Census shows Mary living in Gillingstool with her daughter, Mary. The 1851 Census shows them still living there. This census shows Mary snr was listed as ‘Married’ aged 68 born in Rangeworthy. Mary Ann was aged 28 born in Thornbury. Mary Ann married Edward Trayhurn in Thornbury on 15th May 1864. Edward was a widower and the son of Thomas Trayhurn, a tailor. We struggled to find what happened to John Niblett and then we found we had a copy of a newspaper article in the Times printed in 1825 referring to a court case at Gloucester Assizes. It shows John had become involved with a Mrs Alway and her husband, a brazier was seeking a divorce from his wife. Witnesses gave evidence in court confirming that a criminal act of adultery had taken place and that Mrs Alway had left her husband to live in one of John’s houses. The long article is fascinating and we will be happy to send a copy to anyone interested in seeing it. The jury found for the plaintiff so Mr Alway got his divorce and John Niblett was made to pay £120 as damages. Mrs Lawrence – the 1859 Rate Book shows the property was then owned by ‘Mrs Lawrence’ but unfortunately we don’t know any more about her. George Lane – the 1851 Census shows the property was occupied by George Lane, a plumber who became known locally as ‘Plum Lane’ or ‘Plumber Lane’. The census shows he was aged 25 born in Corsham in Wiltshire and living with his wife, Catherine aged 26 born in Staunton in Gloucestershire. According to all the census records George Archer Lane was born in Corsham in Wiltshire. He was however baptised in the Congregational Chapel in Thornbury on 26th February 1826. That record shows he was born on 6th November 1825 and that his parents were John and Eliza Lane. John was a plumber and in 1849 he left his business in Thornbury to his son, George Archer Lane. George married Catherine Hall in the Bristol area in 1851. Their first daughter, Eliza Croome Lane was born in 1852 and the birth registered in Thornbury. A son, John Croome Lane was born in 1854 and his birth was registered in Thornbury. We are puzzled about two entries on the IGI which show that Eliza and John were both baptised in Bryngwyn, Monmouthshire, on 4th June 1854 and 19th August 1855 respectively. Their second daughter, Catherine Hall Lane was registered there in 1856 and Leah followed in 1859. John Croome Lane died 1860 and the death was registered in Thornbury. The 1859 Rate Book shows George was renting the property at 39 High Street from Mrs Laurence (Lawrence). The 1861 Census shows them in the same property with their daughter Eliza C aged 9, Catherine H aged 4 and Leah aged 2. There was a visitor, Phyllis Clutterbuck, unmarried aged 36 from London. A son, Herbert Edward, was born on 28th November 1861 and baptised on 22nd March 1863. Two other daughters followed, Minnie born in 1863 and Ada Mary in 1870. The 1871 Census shows George Archer Lane aged 45, Catherine aged 40 living with Catherine Hall Lane aged 14 and Leah aged 11, Herbert Edward aged 9, Minnie aged 7 and Ada Mary aged 1. The 1862 Rate Book shows George was now the owner as well as the occupant of the property and later rate books continue to show George as owner until at least 1894. In 1881 George and Catherine had just Minnie and Ada living them. The 1891 Census shows George was living at 39 High Street with Minnie aged 25. Catherine and her daughter Ada were visiting their married daughter, Eliza, and her family in Richmond Road, Bristol. Catherine was described as ‘living on her own means’ and Ada was a draper’s assistant. Catherine died in 1897 aged 67. The 1901 Census shows George Lane was living alone at 39 High Street. He was a widowed plumber and gasfitter aged 75. George died in Thornbury 24th May 1906. Eliza Lane married George Clutterbuck a commercial clerk in 1878. George was a cashier in the Salvation Army Office. We know from newspaper reports at the time that there were strong feelings against the Salvation Army in Thornbury which resulted in riots and violence when they paraded through the High Street. George and Eliza were living in Stapleton in Bristol by 1881. Catherine Hall Lane married Edward Corner in 1878 and she died in 1889. Leah Lane married George Mills at the Holy Nativity in Knowle on 6th April 1889. George was a widower and the son of George Mills. The family settled in Bristol but later moved to London. Minnie Lane the fourth daughter died aged 42 on September 19th 1906 at Gloucester “after much suffering.” She was buried at Thornbury Baptist Burial Ground. Ada Mary Lane married Sidney Albert Cooksley at St Barnabus Church in Bristol on 8th August 1892. They moved to live in Worcestershire. Albert George Champion – the special register compiled in 1939 in preparation for the war shows that another tailor, Albert George Champion,was living there with his wife, Lilian Mary. The property was given the name ‘West End House‘. They were listed as living in the High Street in the 1938 electoral register so we assume that this would have been the same property. Albert was born on 26th September 1909, the son of Charles George, a farmer and his wife, Ella. In the 1911 census the family were living at Olveston. On 28th December 1936 Albert married Lilian Laycock in Thornbury St Marys Church. Albert was described on the marriage certificate as a ‘Tailor’s Manager’ living in Silver Street. Lilian was born on 14th August 1912 in the Hawarden area of Flintshire. She was the daughter of Benjamin and Eva Laycock. During the War Albert was an ARP warden. Albert and Lilian are listed as living at West End House in the 1946 electoral register, but they appear to have separated about that time. The Western Daily Press shows a sale of their household effects held at West End House on 1st July 1946. The 1950 electoral register shows Lilian had moved in with her parents at 15 Gloucester Road. She later married William G. Lewis in 1963. Albert left the Thornbury area. On 25th October 1948 the property was put up for sale at auction by GB Symes’s estate. The property was let on a 14 year lease expiring 1950 and comprised ‘brick-built shop with office and living accommodation consisting of sitting, 2 bed, bath, and kitchen. Main services. Also large workshop with room over. Rear entrance from Sopers Lane. Also a spacious stone-built garage adjoining with entrance from Sopers Lane which was in the occupation of P. Huggins and Son’. Arthur de la Clue Sluce – Arthur was born in 1880 in West Ham. He was the son of Alfred and Emma Sluce. The 1881 Census shows him living with his family in Forest Gate in Essex. He married Edith Garman Fuller at St George’s Hanover Square in London in 1909. The 1911 Census shows that he was a tailor in Forest Gate, West Ham in Essex. Their son Albert was born in West Ham in 1911. By 1916 when their daughter Muriel Edith was born the family may have moved as her birth was registered in Bristol. The first record we have of Mr Sluce trading as a tailor in the High St in Thornbury was in the directory for 1938. We do not believe that Arthur and his family lived in this property, although the sale notice of 1948 makes it clear that he rented the whole building this was for his business. He was sub-letting the accommodation to the Hooper family (see below). Arthur died in Bristol on 18th December 1956. He died in Ham Green Hospital but his address was given as 103 Somerville Road St Andrews in Bristol. Probate was granted to his son and daughter. His widow, Edith died in Bristol in 1961 aged 80. The Hoopers – the 1950 electoral register shows that William H. Hooper and Florence M. Hooper were living at West End, High Street. The sale notice for February 25th 1948 says that Mr Hooper sublet the living accommodation from Mr A. D. Sluce who was renting the whole property and using the shop, office and conservatory himself. The Hooper family must have been living there in 1947 as they advertised the sale of a secondhand Austin 10 1935 car. By 1954 they had left Thornbury. We suspect that they were William Henry Hooper and Florence M. Mosedale who married in the Thornbury area in 1928. We don’t know any more about them. We know that in the late 1950’s it was used by Quality Cleaners. Quality Cleaners at 39 High Street appears in an advertisement in the programme for the Thornbury Flower show of 1956 and in another programme for 1967. Ernest Ford – the 1961 Electoral Register shows that Ernest H and Marjorie E Ford were living at 39 High Street. We understand that they were renting the property. Ernest was born in Pontypool in 1912. He was the son of Thomas Ozias Ford and his wife, Maud Sarah (nee Sawyer). In 1939 Ernest married Marjorie E Musty in the Bristol area. They had two sons: Robert J born in 1942 and Anthony M in 1944, both born in the Bristol area. The family moved to Thornbury about 1960 and they moved in next door to his brother, Thomas Ernest Ford who had established a shoe shop and repair business at 37 High Street. The Halls – the 1970 Electoral Register shows that Arthur and Doreen Hall were now living at 39 High Street. We understand that they were owners as well as occupants of the premises and were involved with the running of Hera Fashion which traded as a clothing shop in the 1970’s until Oxfam took over about 1978. Hera Fashion was trading in Thornbury in 1967 and may be earlier. They also had a branch in Westbury on Trym. We understand that they still own the property. 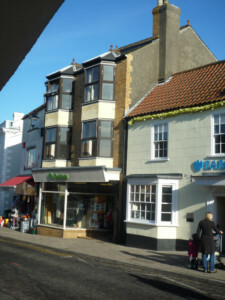 Oxfam – opened in 1977 it became the first of several charity shops in the Town. The photo on the left above shows the shop in 2011. 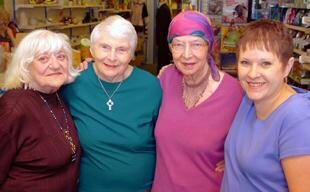 Jan Walters was the first shop manager and she was still actively involved with the shop when it celebrated its 25 years in 2012. The photograph on the right shows three of the original staff of the Oxfam shop including Jan (in pink) with the manager Lucy Rutter. The upstairs floors have been used by hairdressers at the same time.